I am slowly working my way through Omnivore's Dilemma. Not that it is a hard read (rather I was just a bit overloaded with holiday preparations and celebrations). I'm still on the section about corn. It really is fascinating to learn how corn is in everything (and not just food!) and what the farming of corn is all about (from an economic and environmental standpoint). I was excited to see there is a new movie that is about this. 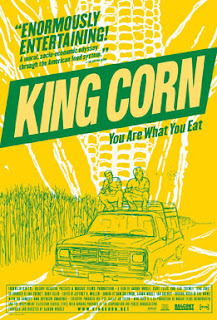 It is called, "King Corn". You can see a trailer for it here. The Austin Chronicle says the film is ". . .as relevant as Super Size Me and as important as An Inconvenient Truth."